Party supplies and food packaging are some of the major contributors to landfill. Composting your eco party supplies once used is the best way to ensure you are doing your bit to make the planet greener. 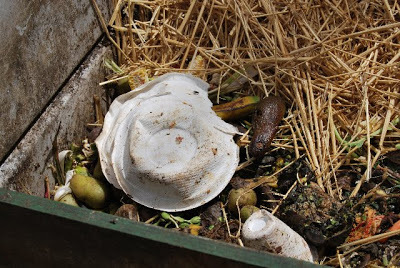 All our tableware can be commercially composted and in some cases can break down successfully in the home compost. For best results try shredding them or cutting them into finer pieces first before composting. We have compiled a list of commercial composters who have accepted and successfully composted our products at their facilities. Please contact them to find out how they can assist you in diverting tableware, packaging and organic waste from landfill. We are also in the process of compiling a list on Councils which accept our commercially compostable tableware in the council green bins. We have added a list of councils below who have confirmed they recycle our cups. Read a recent blog about why biodegradable cups are the better choice over plastic-lined recyclable cups here. Our soft plastic packaging for original packs (we use brown paper bags for small tableware items as we take them out of their original packaging) can be disposed of in the Coles Redcycle Bins out the front of their stores (find the closest one here) or check out the Terracyle website which allows you to post it to drop off points. We have compiled a list of councils that have confirmed to us that they accept paper cups in recycling. The bioplastic lining on our cups actually dissolves during the repulping process and is easier to recycle compared to PE plastic coated cups.